The art of Thomas Kinkade has grown to create a sense of wonder and beauty. As the Painter of Light, Thomas Kinkade was a master at capturing perfect moments in time, hailing back to simpler eras and traditional values. He touched hearts with welcoming scenes of faith, home and nature. His paintings are hanging in an estimated one of every 20 homes in the United States. Fans cite the warm, familiar feeling of his mass-produced works of art. A key feature of Thomas Kinkade’s paintings are their glowing highlights and saturated pastel colors. Rendered in highly idealistic American scene painting values, his works often portray bucolic, idyllic settings such as gardens, streams, stone cottages, lighthouses and Main Streets. Kinkade said he was placing emphasis on the value of simple pleasures and that his intent was to communicate inspirational, life-affirming messages through his work. 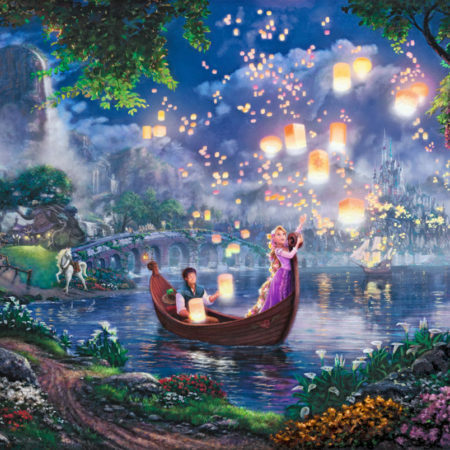 The Thomas Kinkade Disney Dreams Collection celebrates great moments from Walt Disney Films. The artworks are called “narrative panoramas” because each painting tells the entire story of the film in one image. With every piece in the Disney Dreams Collection Thomas Kinkade attempted to portray a panorama of the entire movie, rather than any individual scene. His desire was that the viewers eye could wander around the painting making discoveries in every corner of the image.